At Smoque N’ Bones, we are proud to be in the Great White North and love serving up barbeque with a side of Southern hospitality. We draw our inspiration from the four pillars of BBQ: Memphis, Texas, Kansas and the Carolinas. With each region showcasing its own distinct tastes, it allows us to have fun prepping the food that we serve you and provide a variety of options for different palates. And in the end, what really shines through is our sincere appreciation for all things barbeque. 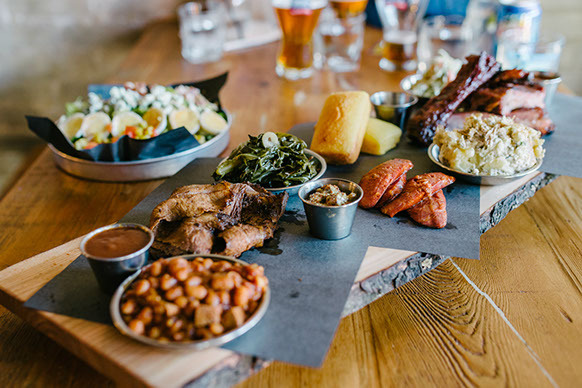 We’re proud of the bones that support this place: from the tables built using reclaimed wood from a house on Palmerston to the WWII bunker and prison lights to the custom bar to, of course, our Southern Pride smoker. When you walk in our doors, we are focused on making your experience one that has you leave with a smile on your face. So whether it’s for a quick bite at lunch, for a takeout order to enjoy in the comfort of your own home, or for an evening of our bourbon cocktails and a rack of ribs, know that we are always stoking the fire to offer you, your friends and your family a smoquing good time.